The effort of the offense is to maintain a tempo of operations that the defense cannot match. Too abstract? Yeah, I agree. Let’s look at the offense through another lens. In a recent conversation I made the claim that the significant difference between TACSIM (law enforcement scenarios) and MILSIM (military scenarios) was that law enforcement perpetually respond to the situation rather than seek the initiative like military forces. Admittedly this statement is an over-simplification of the matter, but it serves to illustrate the point. Police officers are the community’s “first responder” to an emergency situation. As such, they likewise respond to criminal activity. Now, yes, the police force then attempts to isolate the criminals and seeks the initiative – but only as a response to a crime. I mean, it’s not like the police are actively searching through America’s work force for adults with tendencies of self-destructive behavior and then seeking to deter a life of crime. And even if so, this would make for really tedious and boring TACSIM games. Nope. TACSIM deals with the bank robber/hostage situation because it’s way more fun and requires problem-solving in the here-and-now timeframe. Compare this phenomenon with MILSIM, which also requires timely problem-solving. 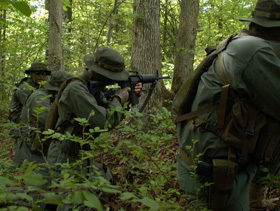 However with MILSIM the situation permits and encourages each opponent to think in terms of seeking the initiative – delivering that first blow and then following up with a series of strikes until the enemy can no longer effect a response. Okay, but why is that so? After all, conventional military wisdom states that the defense is three times as strong as the offense. In fact, it is generally accepted that if built up fortifications are present the offense may require as much as five times the defender’s numbers in order to unseat an effective defense. It certainly doesn’t sound like the offense has the advantage! Second generational warfare with its linear trenches and mechanized weaponry certainly proved the advantage of the defense during the First World War. Artillery and auto-cannon rained death from such distances that many offenses were in disarray before they were ever begun. Even when under attack, the defense’s wire obstacles were incredibly effective at slowing the infantry in the killing zones long enough for the machineguns to inflict absolute carnage. Horrifying. In fact, so many advantages belong to the defense – covered and concealed positions, prepared killing zones, short communication and logistical lines, just to name a few – that it’s amazing anyone would ever consider the offense as an advantage. Yet not everything is rosy for the defense. For the commander planning offensive action it is critical to understand the disadvantages of the defense, and to play against them. The disadvantage of the defense is time and space, which can also be expressed as “when and where”. Keeping aside the notion that the defense might use deception to lure the offense into prepared killing fields, the fact is that the defense does not get to chose the time and place of the attack. Only the offense gets to chose. 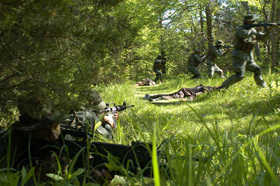 The defense must cover down on the terrain or facilities it is tasked with to defend. Having to defend all of this, the defense is forced to divide its resources over this space. The offense on the other hand can mass its combat power at one or more locations along the enemy’s defense. This is significant because it means that the offense can locally outnumber the enemy – even if the total number of defenders is more than the offense. That’s a real problem for the defense because they cannot bring all of their combat power to bear at any one given point. So it is quite possible for the defense to fall even to an inferior numbered force! Secondly, the defense does not get to choose the timing of the attack. Only the offense does. This is important because, frankly, watching guard is a boring task. It’s tedious, thankless, and when it is cold and raining this task becomes unbearably miserable. No human being can stay perpetually alert. And that’s just what the offense is betting on. So, the initiative to choose the time and place of the attack is the single greatest advantage of the offense. To be successful, the offense will have to achieve surprise by attacking along the least expected section of the defense, or by attacking at the least expecting time, or both. Surprise, mass, and violence of action are the principle elements of a successful attack. We might add to those elements the need to see beyond the immediate objective and to maintain the momentum forward to seize targets of opportunity. This requires either a reserve force to exploit the success of the attack – or at the very least an offensive force that is able to quickly transition to a renewed offense or to buckle down into a defensive position.